This document walks you through the process of configuring permissions for reports generated in Checkbox. Every Checkbox report has its own permission settings, which control who can view/edit/administer the report. Report permissions are configured within the Report Manager. From the Survey Manager view, select the survey you wish to configure report permissions for in order to expand its dashboard. Then, click Analyze -> Reports -> Manage Reports to enter the Report Manager. Once in the Report Manager, select desired report and click edit to open the report editor. 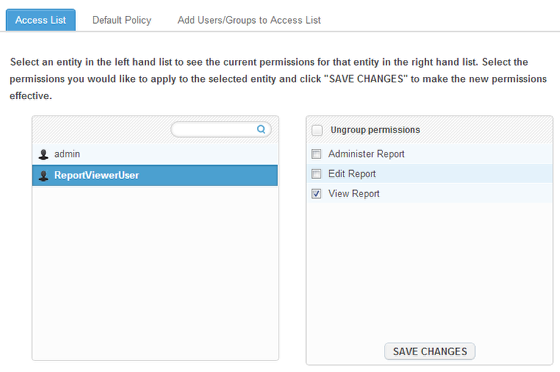 From the report editor, expand Settings and select Permissions. When you open the report ACL, you will be looking at the Access List tab by default. 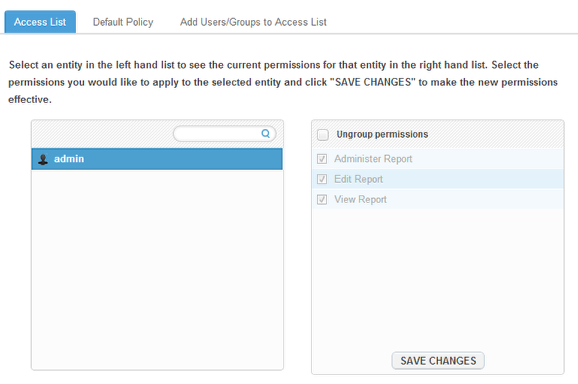 This view shows you who is already included on the ACL (left-hand panel) and what their permission settings are (right-hand panel). NOTE: User roles with the ability to access reports include System Administrator (by default), Survey Administrator, Report Administrator, and Report Viewer. Only these users can be added to a report ACL. Click here for more details on user roles. 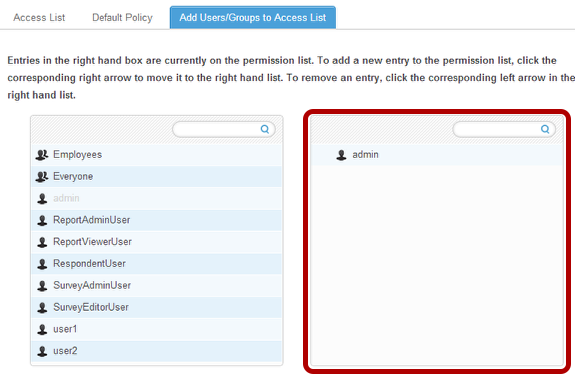 To configure the newly added entry’s permissions, return to the Access List tab. 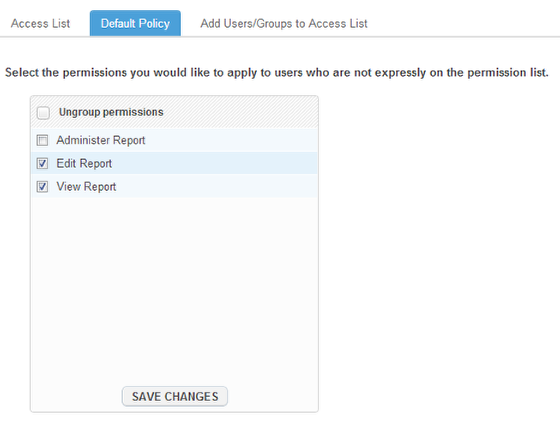 A Report’s default policy is the permission setting for all users not included on the survey’s ACL. It’s also the easiest way to make your report public. 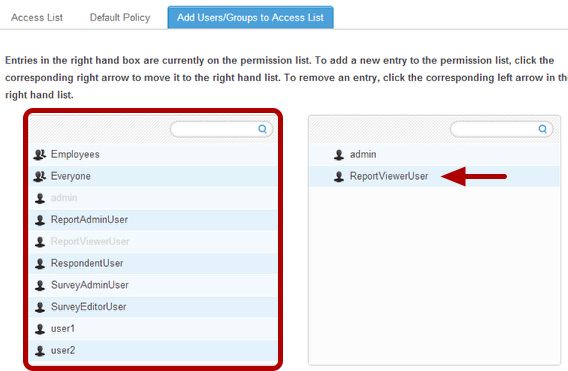 For example, if on the Access List tab you granted specific Report Administrators permission to administer a report, but want any Report Administrator not specified on the ACL to still be able to view and edit the report, you could set the default policy permissions to “Edit Report” and “View Report”. Once you’ve set your report permissions, you can share your report with other users so they can always access your survey’s most up to date results. To share your report, edit the report and click the Sharing button to open up your sharing options. Choose Twitter or Facebook to share directly to your connected social media accounts. Choose Link or Embed if you’d like to copy and paste a direct report link to other users or embed the report on your website. Note that, depending on how you’ve set your report permissions in the steps above, your users may need to log in to view the report that you link them to. Choose Export to PDF to download a static version of your survey charts and graphs.